If it’s mid-March then it must mean brackets, cherry blossoms and…bumper stickers? With fundraising deadlines coming up in just over a week, 2020 Democrats are doing everything they can to show their fundraising strength in the first full quarter of the cycle. So we looked at the power of campaign merch – and I spoke with Jessica Ybarra, deputy director of e-commerce and merchandise for HFA in 2016 about why campaign stores are more than just nice-to-haves for anyone running on the national stage. 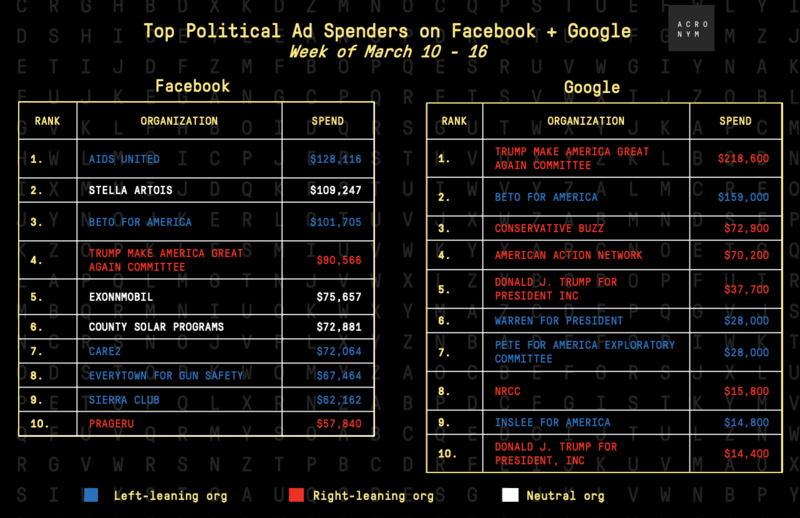 Here are the top spenders on Facebook and Google for the past week. Beto’s campaign outspent the rest of the 2020 field (except Trump) on Facebook and Google, which makes sense given last week was the week he launched his campaign. What is remarkable, however, is that the $260K he spent came in just three days following his launch the morning of March 14th. And we are excited to welcome Mayor Pete to the top spenders list! He spent $28K on Google Search ads last week, putting him on our list for the first time. 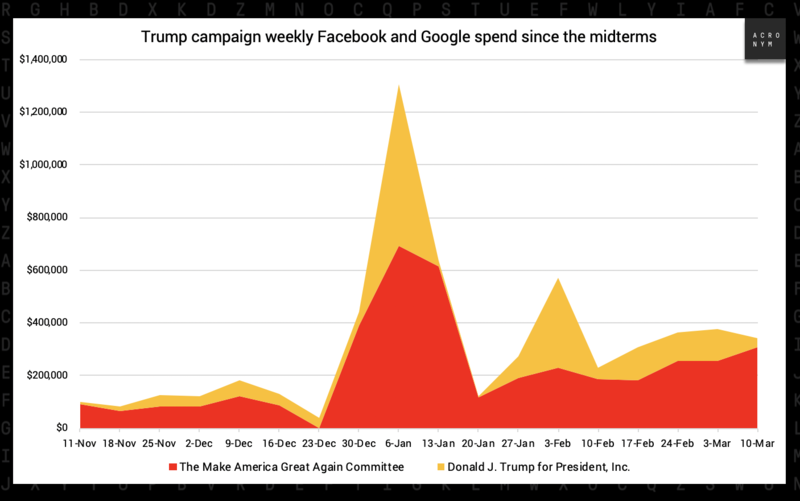 Trump’s two committees spent nearly $350K on Google and Facebook combined last week, making his total investment since the 2018 midterm elections approximately $5.74 million online. Here’s a graph of his campaign’s weekly spending. 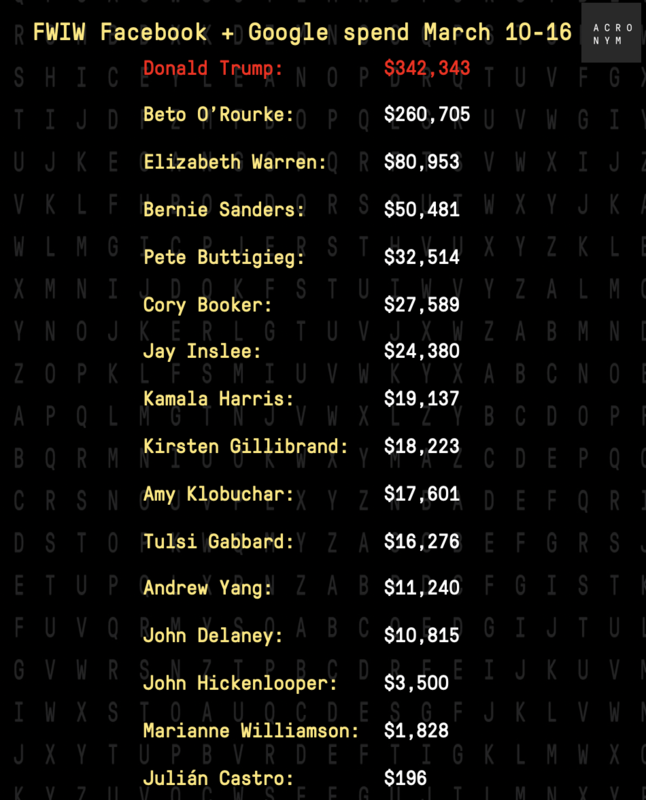 As the first quarter of 2019 comes to a close on March 31st, candidates are making their first end of quarter pushes to show their early strength and support with eye-popping fundraising numbers. One way all of the campaigns are trying to do this is through the sale of merchandise that you can purchase through each campaign’s website. Selling campaign swag isn’t just a creative way to bring in $15 or $30 donations. It’s also a vehicle for campaigns to raise awareness about their candidates and empower supporters to be messengers of the campaign narratives in their own right. 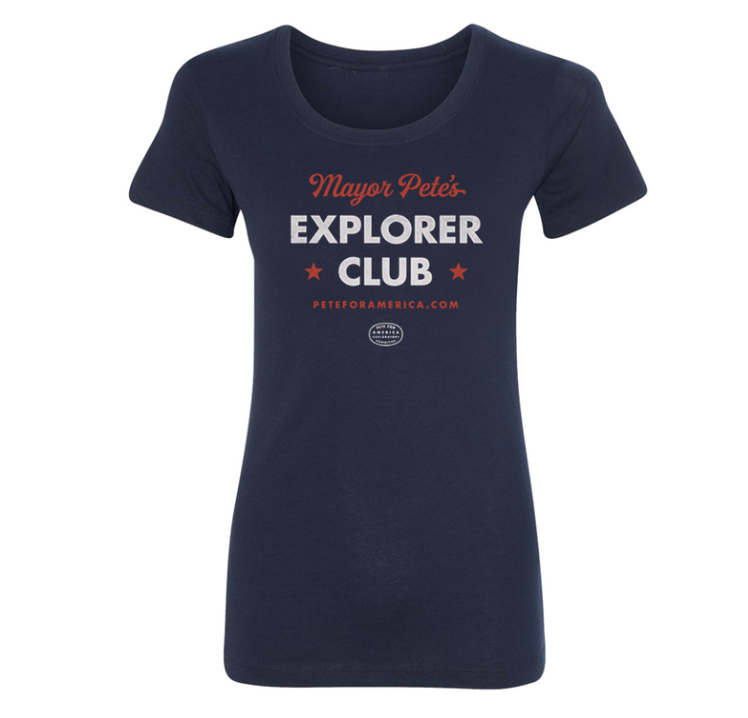 After all, they are literally wearing a campaign button, or shirt, or tote bag, or hat…you get the point. 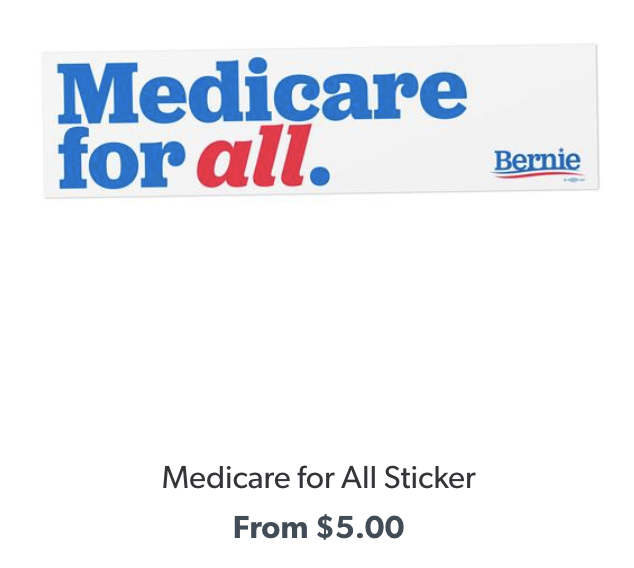 This week, we looked at how the items many of the Democratic candidates are selling in their swag shops are representative not only of the campaign message, but signal what audience they’re trying to reach and their main challenges early on this cycle. 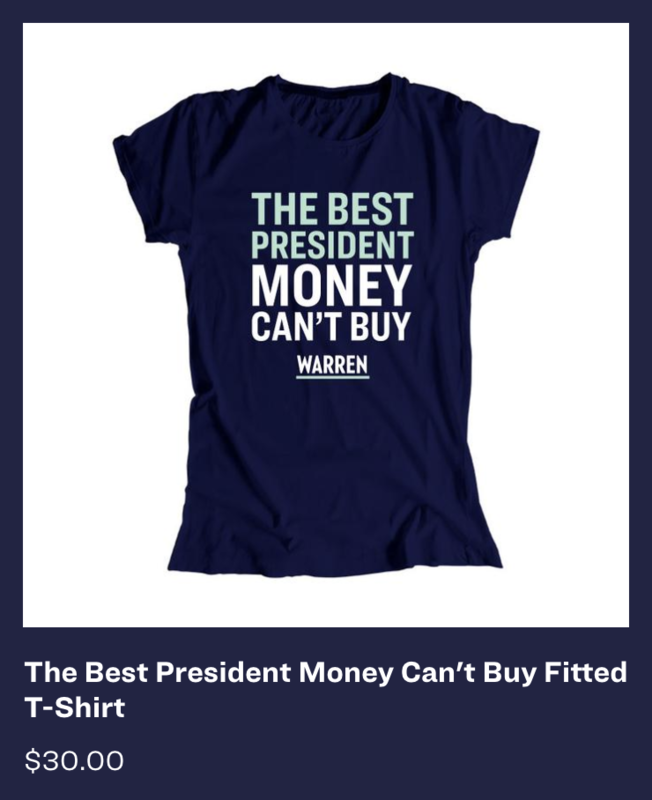 And we talked to an expert in campaign merch – Jessica Ybarra – who helped run Hillary for America’s e-commerce in 2016 about how political merchandise has changed in recent years and why candidates today can’t afford not to have swag shops. 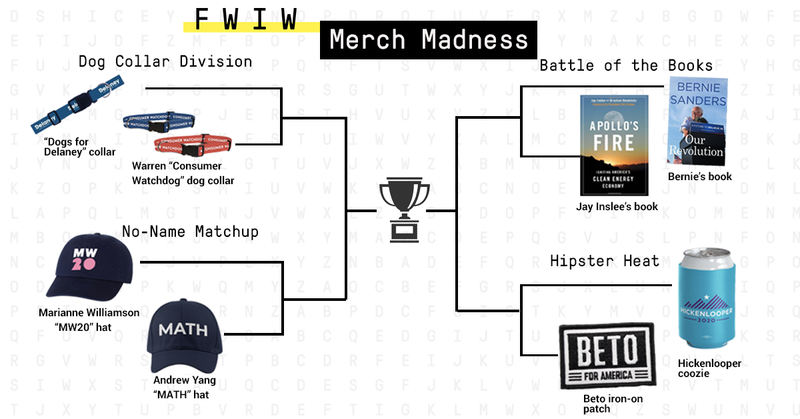 We’re not going to go through every single campaign’s swag shops, but here are a few examples that highlight how merchandise can be a lot more than just a vehicle to raise money. As Jessica told us, candidates who are relatively well know (like Bernie or Elizabeth Warren) can leverage merch to drive campaign messages and connect candidates directly with their supporters. 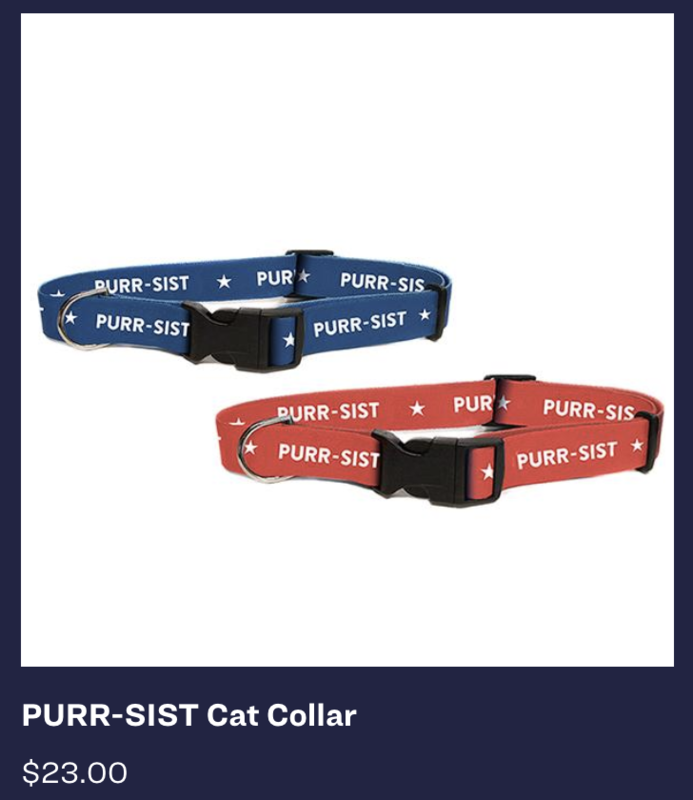 For example, Bernie’s campaign has been selling message-centric merch since day 1 (he was even giving out these Medicare for all bumper stickers before he announced his candidacy) and Elizabeth Warren is selling t-shirts, dog and cat collars and aprons that promote her anti-wall street message and remind voters of the “nevertheless she persisted” moment. Looking through some of these campaign stores, it’s clear what target audience certain candidates are trying to reach. 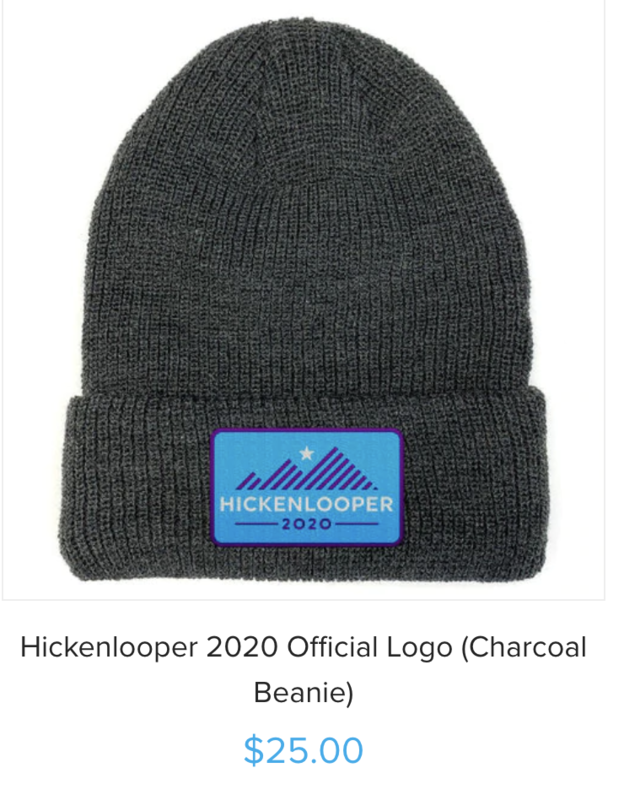 For example, John Delaney, who is driving a pro-business message is selling golf balls, Kirsten Gillibrand, whose campaign’s message is particularly focused on reaching women is selling baby onesies, and John Hickenlooper who’s trying to define himself by his work as Colorado governor and brewery-founder is selling koozies and beanies. 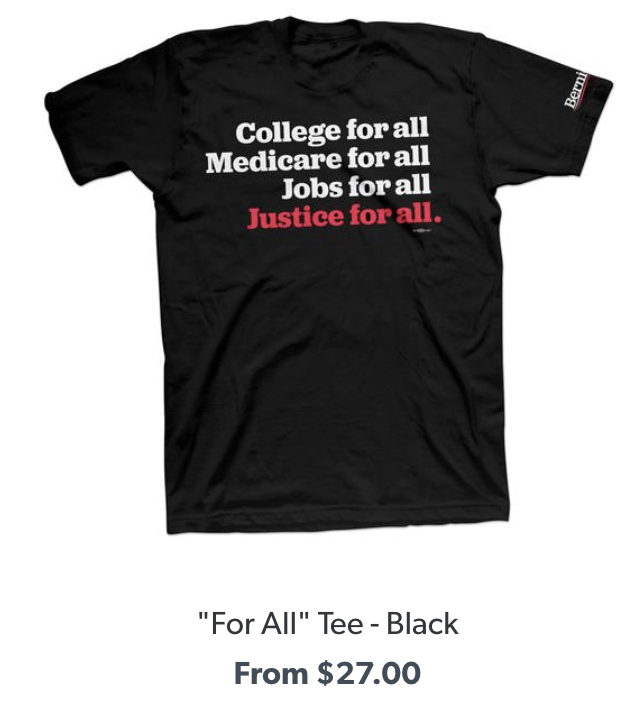 For some candidates, swag shops can be another way to reach the 65k donor threshold needed to get to the debate stage in June, or to keep a campaign operation staffed up. 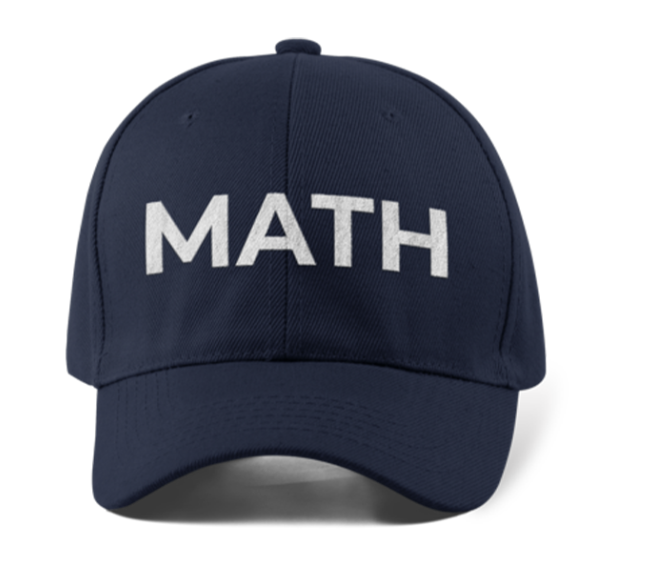 For example, Andrew Yang’s “MATH” hat doesn’t help to raise his name ID, and Mayor Pete’s “Explorer Club” shirts don’t prominently feature Buttigieg’s name, but they could be more valuable to raise critical early funds from supporters who feel directly connected to those “inside joke” types of products. The following is an abridged version of Q&A with Jessica Ybarra, Deputy Director of E-commerce and Merchandise for Hillary for America in 2016. We’ll be posting more from this conversation on our Twitter later today – so follow along @anotheracronym. Rachel: How has the industry evolved since 2012? Even since 2016? Jessica: I didn’t get involved in campaigns until 2016, but as a supporter I remember there only being a small assortment of merch in 2012. In 2016 campaigns really went beyond the standard t-shirts and buttons and made a wide array of products. Now, you see that candidates have a store on their site the day they announce their candidacy. An online store is no longer a nice to have, it’s essential. R: What was the most surprising item that did well in HFA’s merch store? J: We made a cross stitch throw pillow that said “A woman’s place is in the White House.” We thought it would be a fun thing to try, but I never imagined it would be a hit. Every time we re-stocked they would sell out within days. R: What would you recommend to 2020 candidates? J: Have fun and think about the longevity of the products you produce. It’s so cool to see all the different types of campaign merch people hold onto and wear years later. 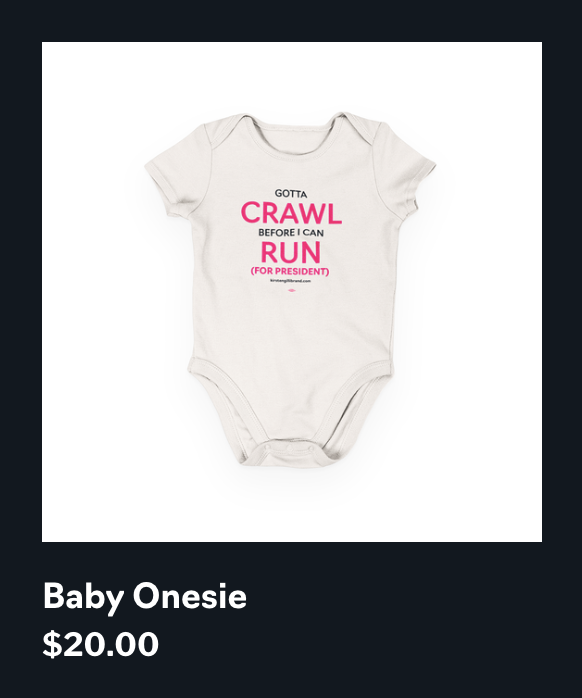 R: What do you want to see right now in 2020 candidates’ merch stores? J: More color! It’s so great to see candidates go outside the traditional presidential color palette of red, white, and blue. R: Would a physical store ever make sense for a candidate? J: Pop-up shops at rallies are a great way to raise money and for supporters to feel connected to candidates. When you purchase merch at an event you have a memory associated with that item. That’s all for this week. Thanks for reading, and make sure to share the FWIW sign up link with friends and colleagues. We’ll be posting more anecdotes from our Q&A with Jessica and highlighting some of the more interesting items from the swag shops on Twitter later today, so follow us and feel free to email us with ideas of what you’d like us to dive into next.